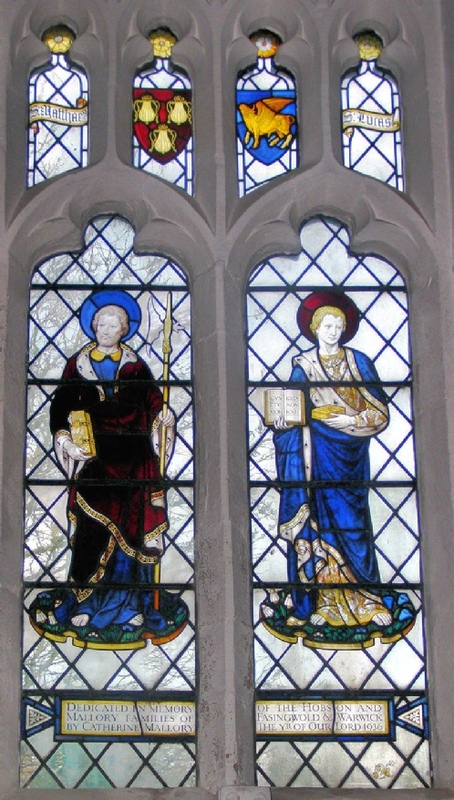 The two saints are depicted as Evangelists and Apostles. St Matthew is shown with a tax collector’s box. St Luke is shown with a physician’s pill box. Our Lady is depicted carrying her symbol - a lily. St John is carrying a chalice. Note the complicated detail surrounding the main figures. 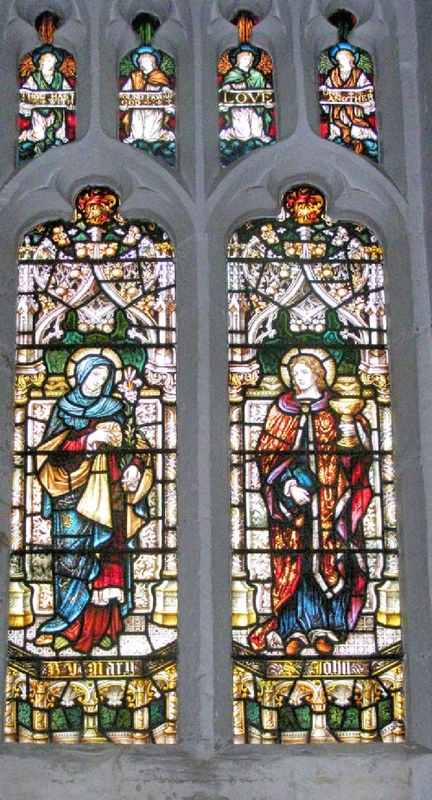 This is typical of late 19th century stained glass. (a) In the small top centre panel, Jesus is shown encompassing and blessing the world. 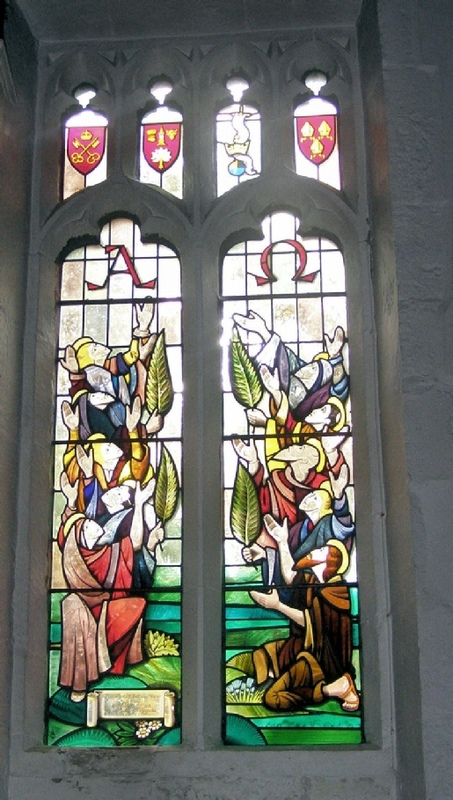 (c) The central panel – the lower section depicts John the Baptist baptising Jesus. The dove is appearing above. The upper section shows The Crucifixion with the women weeping at the foot of the Cross. (d) The right hand panel – Jesus is shown after His resurrection, appearing to His disciples by Galilee. Jesus is showing His wounds to the disciples. Peter holds the Key to the Kingdom. This is a very modern and colourful window. It depicts “All the Saints” (half of the dedication of the church). 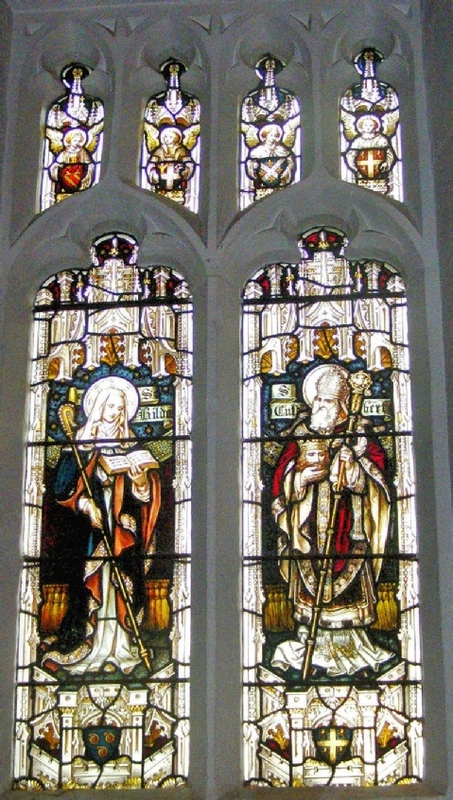 The figure in brown in the right hand corner is probably John the Baptist (the other half of the church’s dedication). The palm leaves represent the “adoration of the Trinity”. Note the A and Ω symbols – Jesus said “I am the alpha (α/Α) and omega (ω/Ω). This is a very colourful window, containing a lot of detail. 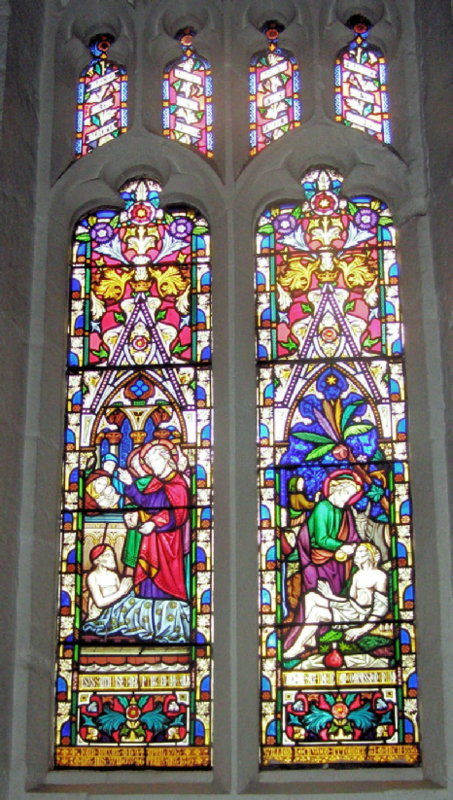 The style compares with the East window. The left hand panel depicts Jesus curing the man at the Pool of Bethsaida. The right hand panel shows the Good Samaritan helping the man who was attacked and robbed. 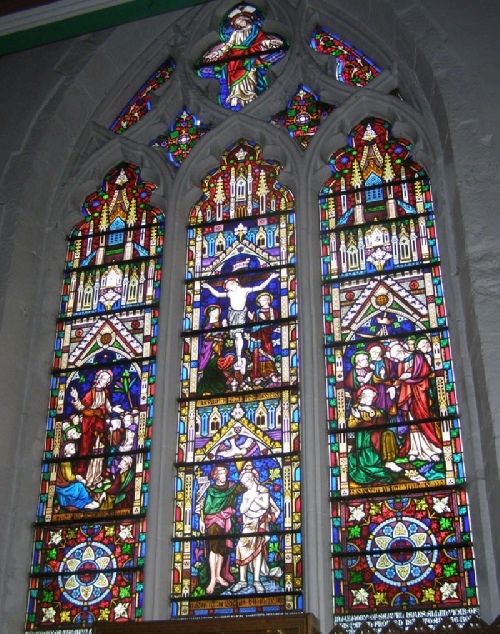 (The Westerman Window) This is probably the oldest window in the church. 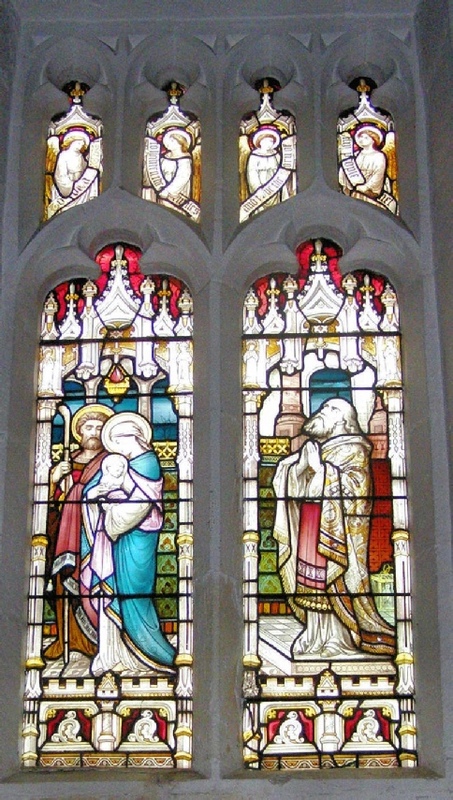 It is a memorial to the foundress of Easingwold School.The left hand panel shows Jesus as a twelve-year-old boy talking to the Pharisees and elders in the temple. His mother is peeping at Him through a curtain. The right hand panel depicts Jesus talking to the children. He said: “Suffer the little children to come unto me”, and he blessed them. 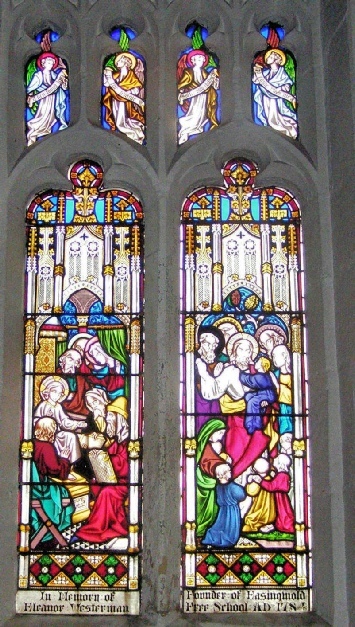 Note the rather complicated details – this is typical of 19th century stained glass. This window is overcrowded, with a narrow range of colour. It needs very careful perusal. The left hand panel depicts the women at the entrance to the tomb. The stone of the tomb is difficult to pick out from the background. 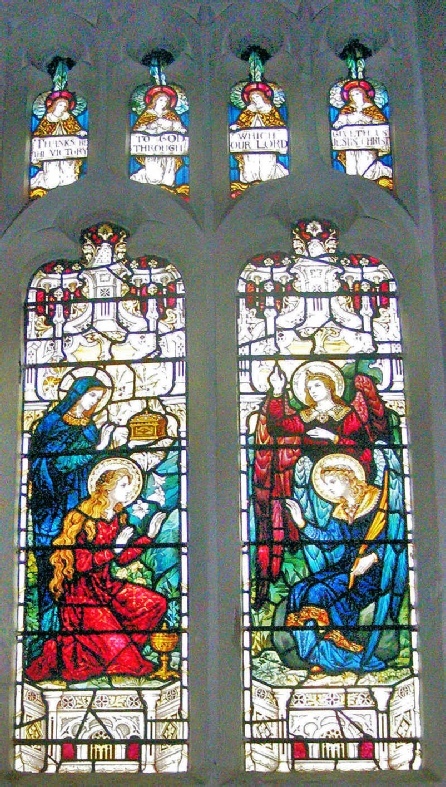 The right hand panel shows the Angel appearing to Mary on the morning of the Resurrection. 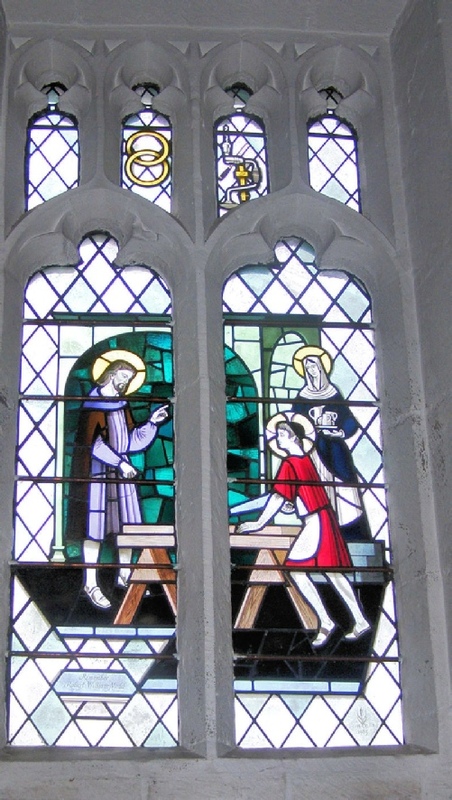 The left hand panel shows us Hilda, who established the Abbey at Whitby. She seems to be carrying a shepherd’s crook (or is it a crozier?)  It is not certain what the shield below her represents. Could they be ammonites, thus suggesting her relationship with Whitby and geology? The right hand panel – St Cuthbert lived as a hermit on the Farne Islands and subsequently became Bishop of Lindisfarne. Both he and Hilda were involved in the Synod of Whitby. St Cuthbert is shown holding the crowned head of Oswald, who was the King of Northumbria. The tomb of St Cuthbert is in Durham Cathedral, and St Oswald’s head was buried with St Cuthbert’s body.